The statistics below paint a graphic picture of the importance of literacy. 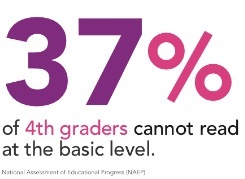 Two thirds of students who can’t read proficiently by the end of 4th grade end up in jail or on welfare…and 37% of fourth graders cannot read at the basic level. Statistics from: Begin to Read Literacy Statistics & Pennsylvania Department of Education. Read more on this Pivot Point at the Huffington Post. 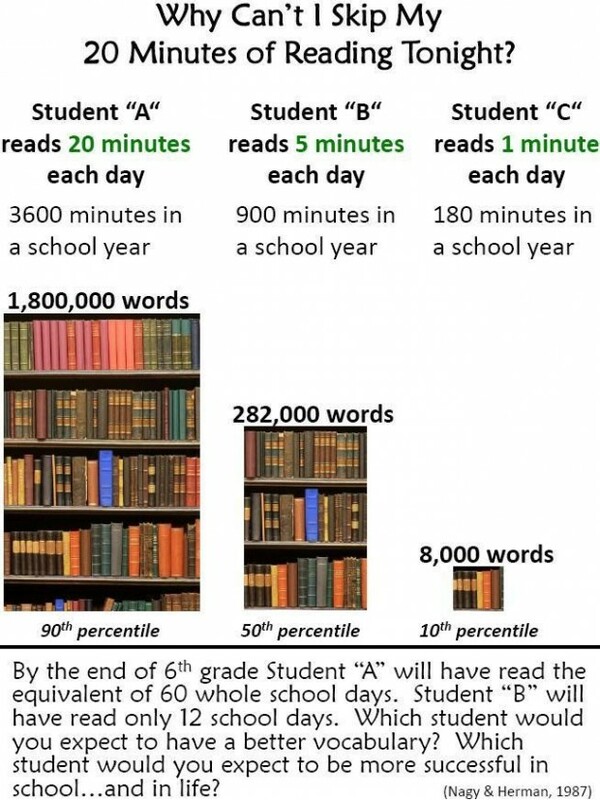 Students who read 20 minutes a day from Kindergarten through 6th grade score in the 90th percentile on tests, as the graphic below from edudemic illustrates. 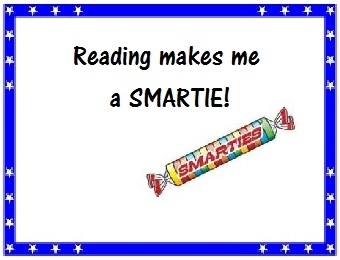 Basically, reading makes you a Smartie! The value of incentives and rewards for reading (or anything) can be debated. However, providing feedback on progress and explaining why reading is important can be beneficial. Here are some ideas for a simple incentive program to encourage reading and playing phonics games to increase literacy skills. READ bookmarks: each day that you read 20 minutes, color or punch a star on the READ bookmark. 5 stars = 1 gold (chocolate or token) coin. 1 full bookmark (4 gold coins – 20 days of 20 minutes of reading) = 1 book buck. 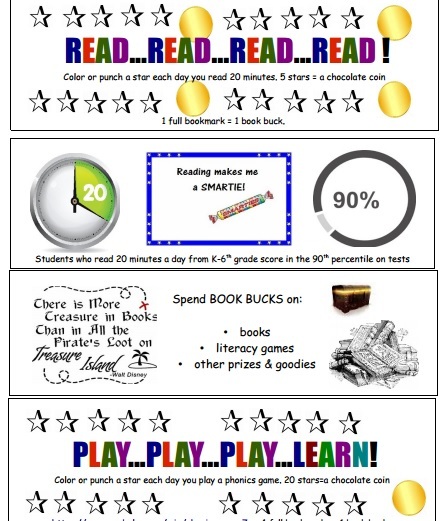 PLAY bookmarks to earn Extra Credit: Each day that you play a phonics game, color or punch a star on the PLAY bookmark. 1 full bookmark (20 stars/20 days) = 1 gold (chocolate or token) coin. Please note that many online phonics games require Flash and may not work well on some tablets and smartphones. It can be helpful to download the Puffin browser. 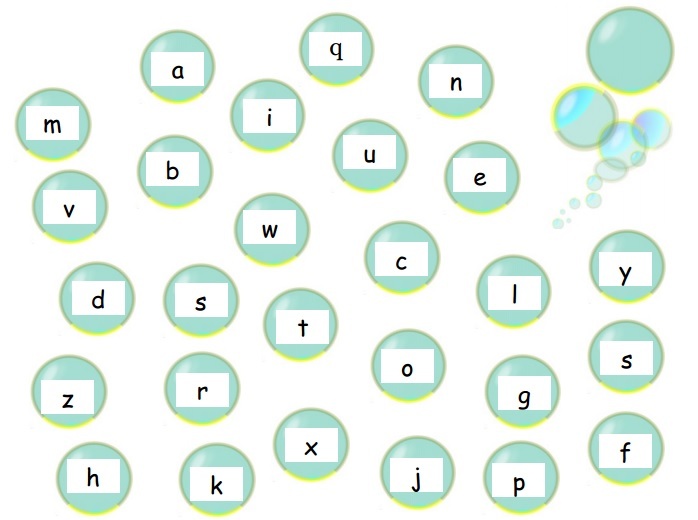 Free online phonics games are collected in one place here at Symbaloo. 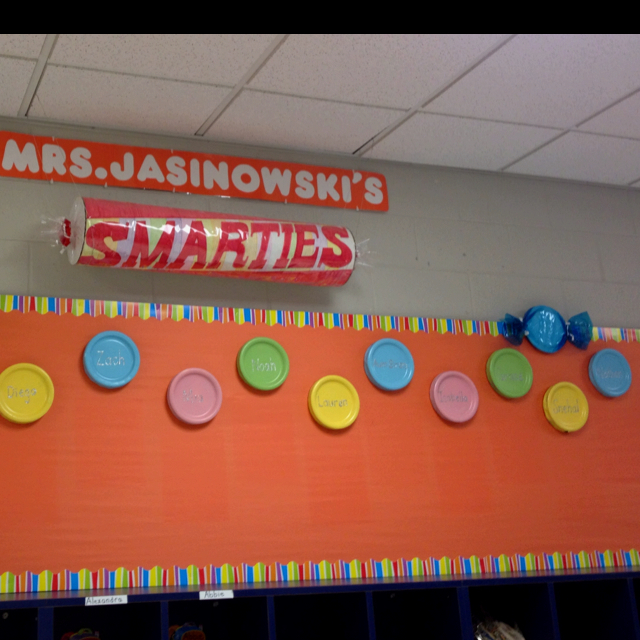 A bulletin board like this one with student names and how many bookbucks have been earned might encourage more reading too. Another option is a thermometer chart to track class progress posting the total number of minutes read within a time period. Set a goal and have a class party when it is reached. 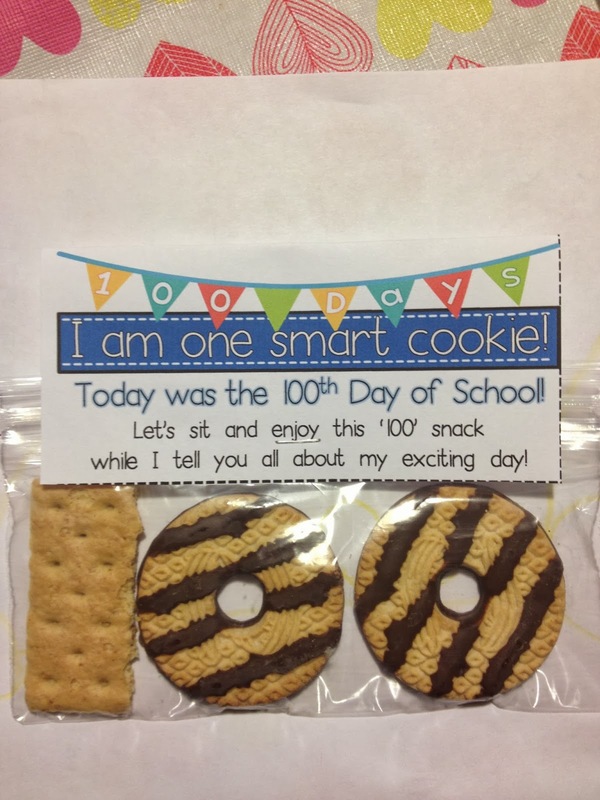 How about modifying this idea from Crayons & Cuties in Kindergarten to celebrate learning 100 sight words? Non-candy: READ Pencils, READ bracelets, Notepads, Magnetic bookmarks, Alphabetimals coloring book, Target bargains like these Dr. Seuss bags, Library card socks…more ideas are at my Library & Books Pinterest Board. Super Reader – anything with a Superman theme: can coosies, socks, etc. Books: Feed Me Words, books by Brian P Cleary, or any you choose. The statistics show that improved literacy skills lead to a better life. Learn more about how to create a phonics kit for teaching reading. I recently finished “Great at Work” by Morten T Hansen, who illustrates with examples and research 7 principles for working smarter. I was most interested in the first part of the book, which covers mastering your own work. The second part involves working with others, and a final part is about work/life balance. Here are my notes on the book. Do less, then obsess. Identify high value priorities and focus on those. Occam’s Razor: seek the simplest solution-as few as you can, as many as you must. *This principle is important for work/life balance. Don’t just learn, loop. Try experiments, measure the outcome, get feedback, modify based on the results. P-Squared-tap into passion and purpose. Match excitement and enthusiasm with contribution to society. Both are needed for high performance. *This principle is important for job satisfaction. Forceful champions-advocate by evoking emotions with stories of impact. Use smart grit to gain insight into the concerns of opposition, design strategies to overcome the concerns, then persevere in the face of difficulty. Fight & Unite-Have effective meetings, commit to decisions. Two sins of collaboration: failing to, and over-collaboration. To be disciplined: know when to and why, What’s the Benefit? Know the common goal, reward results, not activities. Trust boosters: verify, start small, clarify & educate, bond w/team exercises. The Annual Review Toolkit contains 27 printable tools in a 30 page pdf to create a binder with everything you need to stay on top of regular reviews and on target with goals that align with your values. It includes Productivity Tools for a System & Routine, Goal Tools for Review, Brand & Purpose Tools for Focus. It gathers many of my best resources in one place together with the steps for an annual review. See the full contents of what is included. Available free for a limited time, grab yours now before this offer goes away! I recently read “Mind Hacking” by Sir John Hargrave. I enjoyed this look at changing the mind from the viewpoint of a computer programmer with proven “geek” cred. Throughout the book there are mind experiments that virtually gamify mental change. In the spirit of open source and collaboration, the author provides the book free online as well as for purchase. 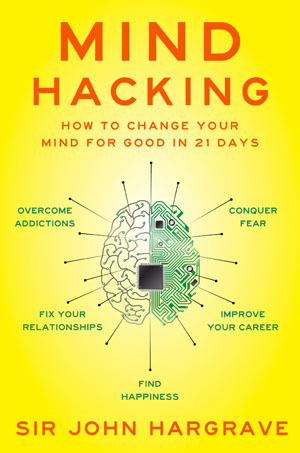 There are links to both at www.gitbook.com/book/jhargrave/mind-hacking/details, plus a free app. Analyzing – We can change our mental loops. This section of the book is about becoming more aware of where the attention is, eliminating distractions, and retraining attention with meditation. Imagining – This section talks about thought experiments and exploring the mind to expand what is possible. “Imagination is hard mental work” but everything that is created is imagined first. Reprogramming – The author talks about the power of writing things down (“Until it’s on paper, it’s vapor”), and how mental simulations (aka vizualizations) can help athletes improve performance. He describes agile development, where a minimum viable product is released and then improved upon. He suggests using LASER subgoals that are: Limited, Achievable, Specific, Evaluated, and Repeatable for improved focus. Many of the books that I read in the past year were Screen & Page Reads. I wrote one post referring to “The Code of the Extraordinary Mind,” by Vishen Lakhiani: End Goals Lead to a Meaningful Journey. My favorite fiction book this year was by far “Last Days of Night” by Graham Moore. Set in the days of the discovery of electricity, and based on fact, this is the story of the competition between Westinghouse and Edison to be the dominant force. I found it fascinating!